Associated British Foods, owner of Primark, has hailed the clothing chain's UK performance as "remarkable" after a boost in like-for-like sales.However, the UK results were not enough to offset a decline in Primark's same-store sales overall.Retailer JD Sports also reported a rise in sales, which it said was "an excellent result".The UK results of both firms come despite the crisis faced by some High Street chains.In the 24 weeks to 3 March, Primark saw 3% growth in its UK like-for-like sales, which strip out the effect of new store openings. This increase came "against a backdrop of unseasonable weather in Europe" and a decline in margins due to adverse currency movements. "Our UK performance was remarkable in the circumstances and delivered a strong increase in our share of the total clothing market," it said.However, this was not enough to boost its overall like-for-like sales, which fell 1.5% after "unseasonably warm weather in October" and "freezing temperatures across northern Europe". 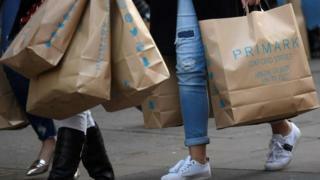 Sales in Northern Europe declined in the period.Primark has 352 stores worldwide, with 184 in the UK. There was a drop in sales in Germany, where the chain has 25 stores. The fashion chain owner said it expected profit growth to pick up in the second half.Meanwhile, like-for-like sales at JD Sports stores grew 3%, while profits were up by 26%, in the 53 weeks to 3 February. "This is an excellent result demonstrating our capacity for continuing growth in both existing and new markets, and the strength of our offer in store and online," said Peter Cowgill, JD Sports executive chairman.Chains on the UK High Street have been facing a combination of a squeeze on incomes and rising overheads.Prezzo, New Look and Carpetright are among the big names that have been struggling recently.